Okay so in the midst of pretty much all of my first essay uni deadlines, I saw a lot of great theatre (and some not so great) but due to my immense disorganisation, I never reviewed any of it. Until now! 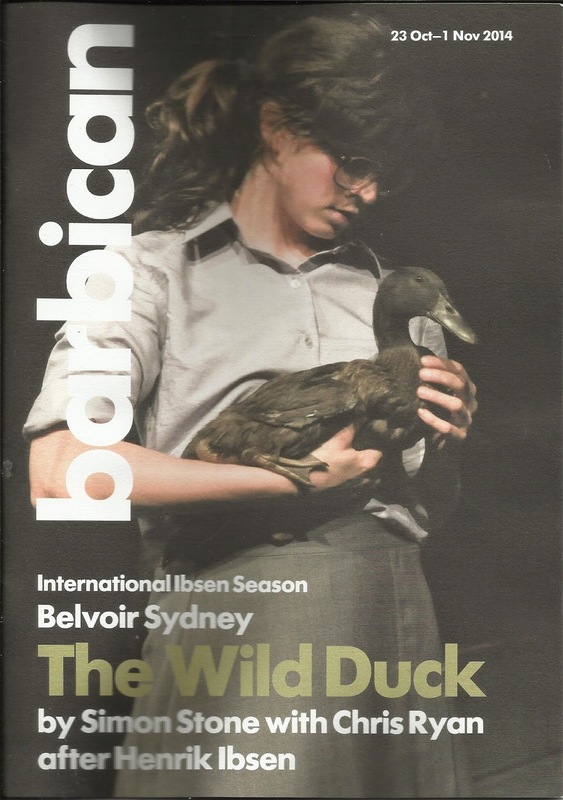 I was fortunate enough to win a pair of tickets to see The Wild Duck at the Barbican, thanks to +WhatsOnStage's weekly twitter competition (which is definitely worth entering by the way). So on Friday 31st October, while the rest of my housemates dressed up for Halloween, I headed up to London to meet a friend, grab some Wasabi (also highly recommended! According to London students it's the place to eat, and I can't say I disagree!) and see the show. Now, despite being a fan of Ibsen's writing, prior to winning the tickets I know almost nothing about this production other than the fact that it was a reimagining by Simon Stone. The plot didn't really jump out at me, and I wasn't exactly buzzed for it beforehand. Having said that, I really enjoyed it! The plot was very relevant to present day issues, touching on corruption, affairs and confusion surrounding paternity in a way which was both effectively dramatic, and thoroughly entertaining. What was particularly striking for me though, was the staging. Almost all of the play's action is performed inside a large glass case on stage. Although the 'glass case' was quite a ham-handed metaphor for the play's themes, it did a great job of allowing the audience to be a fly on the wall, especially during some of the darker, more uncomfortable moments. It also highlighted an element of the plot which this play is quite famous for. Typically Ibsen's play focused on the Bourgeois society, yet The Wild Duck followed the lives of mostly lower middle class people. For an Ibsen fan like me, it was an interesting and refreshing twist on what I was used to seeing. All in all, the show was definitely worth a watch, and I thank +WhatsOnStage and +Barbican Theatre for my free tickets. A delightful yet devastating way to spend Halloween.